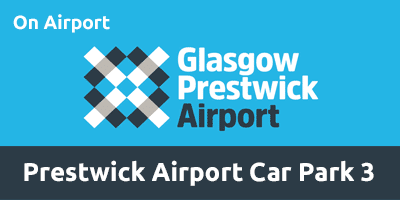 Looking for a quick and convenient parking option at Prestwick Airport? Located minutes from the terminal, Car Park 3 is a self-park facility that’s ideal for travellers looking for a fast and cost-effective parking solution. Dodge the transfer buses and stroll straight to the nearby terminal building via the railway station. It’s just a 3-5-minute walk to the terminal building from the car park, however this car park is not suitable for persons with reduced mobility. There's no need to worry about your vehicle while you're away, either; this Park Mark Safer Parking Award-holding facility offers 24-hour CCTV and regular security patrols. There are no disabled facilities available in this car park, however disabled spaces are available in Car Park 1 & 2 adjacent to terminal and shuttle bus pick up points. This car park is open throughout the year. Take the third exit at Dutch House Roundabout and continue on the A78. At the Monkton Head roundabout, take the 2nd exit towards the airport on the A79. Have your booking confirmation on hand. On recognition of your vehicle registration the barrier will lift. Should you have any issues please press the intercom button for assistance. Park your car and then take the short walk to the terminal via the railway station and air walk. Collect your car and drive to the exit. On recognition of your vehicle registration the barrier will lift and allow you to exit the compound.